My favorite source of heritage breeds of pork, pasture-raised with tender loving care, is Caw Caw Creek, based out of North Carolina. They raise only a handful of pigs in an area that other pig farms would jam in hundreds. The pigs are allowed to roam freely and forage for their food. And as a result, the pork is some of the most flavorful you will find anywhere. (www.cawcawcreek.com) Tell Emile I sent you. 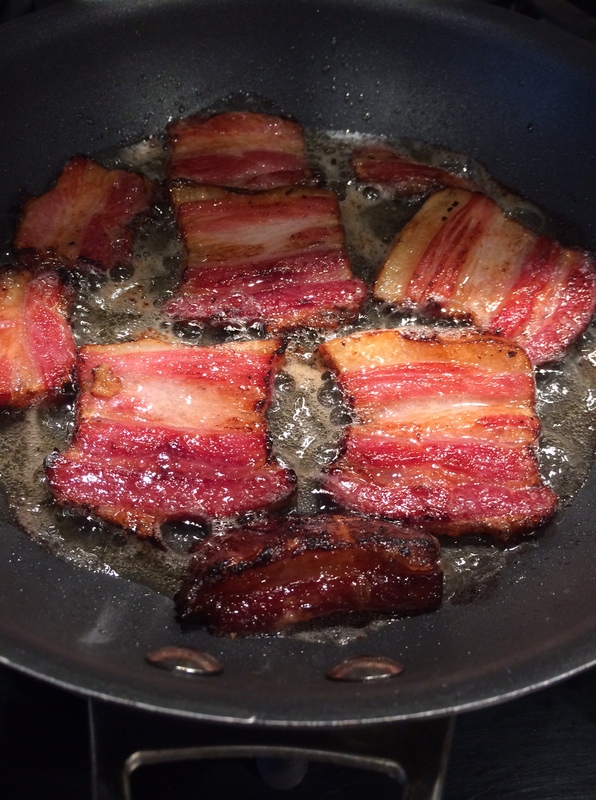 Bacon comes from the pork belly. So I bought a couple slabs from Caw Caw Creek, and followed the simple curing techniques outlined in a great book about making all kinds of prepared meats (sausages, salamis, and of course, bacon): “Charcuterie,” by Michael Ruhlman and Brian Polcyn. If there is a skin on the belly, I choose to remove it before curing, but that’s a personal preference. I don’t eat it, so why have it? And it’s so thick, it blocks the cure. To cure bacon, all you really need is some salt, some sugar, a little pepper, and what they in the curing biz call “pink salt,” which is not to be confused with salt that happens to be pink, like you would find in a basic spice catalog. Pink salt is bright pink—to let you know that this is special salt that should only be used in small quantities for curing. And the reason for that is because it contains nitrites. Nitrites delay the spoilage of the meat, and help preserve the flavors of spices and smoke. That’s good. But nitrites can break down into nitrosamines, which have been known to cause cancer in lab animals. But let’s face it: you would need to eat a ton of cured meat to really worry about this. Once you rub the pork belly with the salt and sugar mixture, place it in a Ziploc bag, squeeze the air out of it, and seal it well. Place in the fridge for about a week, flipping it over a few times to let gravity do its work. You’ll see that the salt will draw moisture out of the meat and form a brine. This brine will continue to cure your pork belly, so leave it in there. 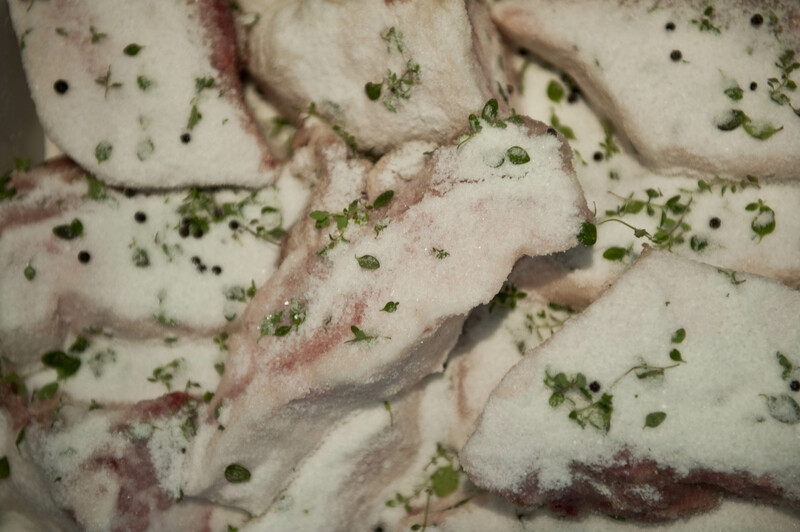 Once the pork belly has been cured, wash the brine off the meat, pat dry with paper towels. Now it’s time to cook. 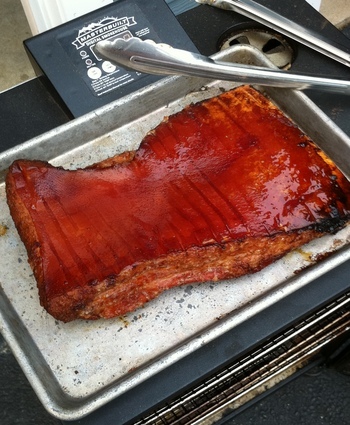 You can simply cook the pork belly at 200 degrees for about 2 hours, until the internal temperature reaches 160 degrees, or do what I did: place the pork belly in a digital smoker, cooking it at 200 degrees for 1 hour, then adding hickory chips and smoking it at 200 degrees for another hour. The reward is so worth the effort. If you don’t want to bother going online to buy your pork, simply go to your favorite butcher and ask for pork belly. It’s usually available. And if you’re making one slab of bacon, why not make it three or four? It freezes well. And…you will eat it. You know you will! Pork is magical. And though I’ve loved bacon and pork chops all my life, it’s only recently that I’ve started to appreciate other cuts of pork and how they’ve been prepared. No store-bought bacon for me. 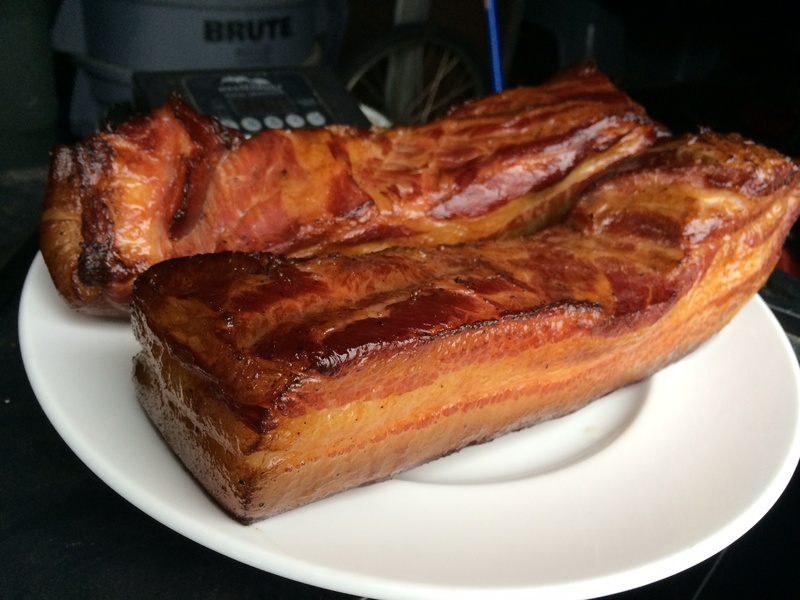 I have a favorite website where I’ve bought the best quality bacon on line from Missouri for years: http://www.smokehouse.com/. My Italian pork sausages and larger cuts of pork (like shoulders, bellies, and big fat pork chops) come from Caw Caw Creek, the only certified humane heritage breed pork farm in North Carolina. http://www.cawcawcreek.com/. And sometimes, my pork can come from surprising places, like my rafting guide friend Rob, whose family runs Crabapple Whitewater in the Forks, Maine, where I raft on the kennebec and Dead Rivers every year. Rob decided to raise two pigs this past year, and he’s willing to trade pork jowls for a few bottles of my homemade Lithuanian honey liqueur called Krupnikas. It all started when I wanted to make an authentic spaghetti carbonara. 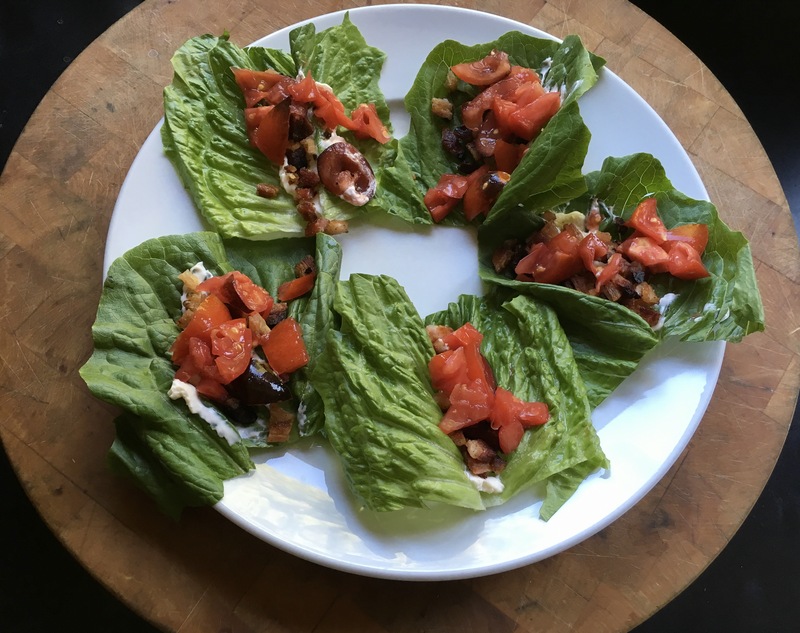 Since I worship at the Italian food altar of chef Mario Batali, I went to his website to look up his recipe. It said that although many people use bacon or pancetta (both from the belly of the pig—the bacon is smoked, pancetta is not)…authentic carbonara is made with guanciale (pronounced gwan-chee-ah-lay). 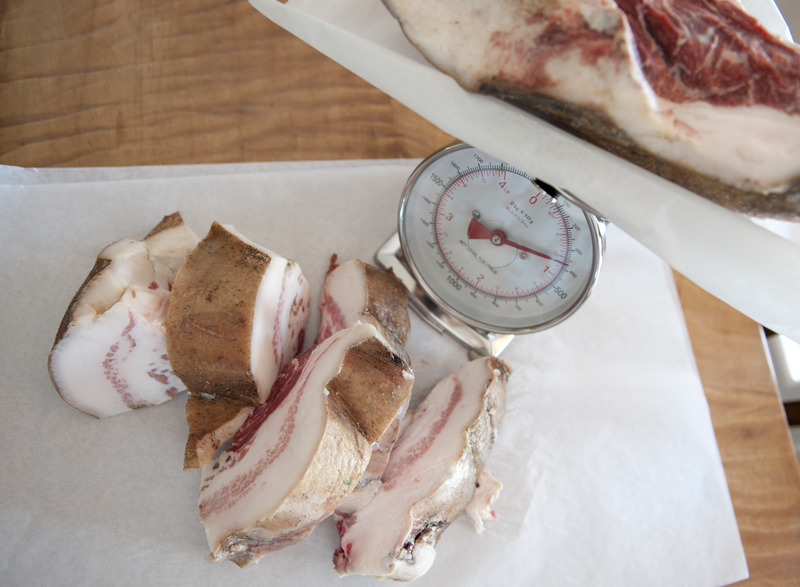 Guanciale is cured (but not smoked) and made from pork jowls…that would be the cheeks of the pig. According to Batali, you take raw jowls, cure them for about a week in sugar, salt, peppercorns and fresh thyme, then hang the meat to dry. The result is a delicious pork product that you slice and fry and use in carbonara or any other recipe that calls for a tasty addition of porky goodness. 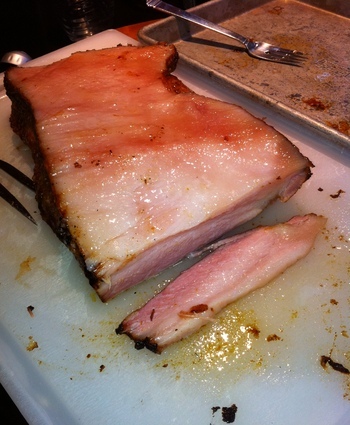 The flavor of pork jowls is subtly different than that of pancetta. There is a very special mouth-feel to the fat that makes guanciale so good. And once I made my first batch, there was no turning back! But finding raw pork jowls was not easy. 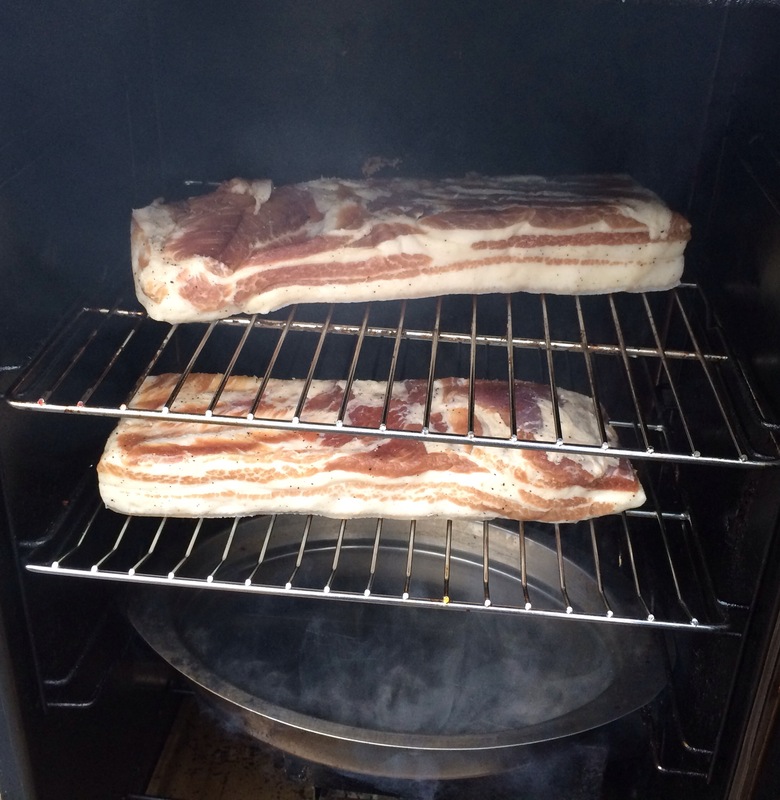 Many websites offered smoked jowls. But raw jowls were almost impossible to find, and I just about gave up until I visited my friends Sal and chef Aaron at the Back Eddy in Westport, Massachusetts. I told them of my dilemma and they said: “Pork jowls? Oh, we can order them for you!” I was psyched! 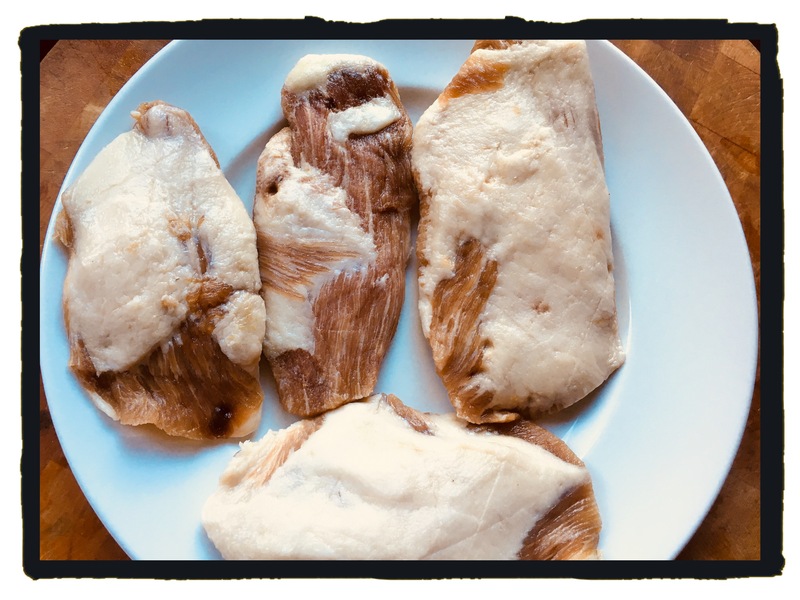 About a week later, I picked up my jowls, individually wrapped in hermetically sealed ¼ pound packages, and my curing began, following Batali’s recipe. 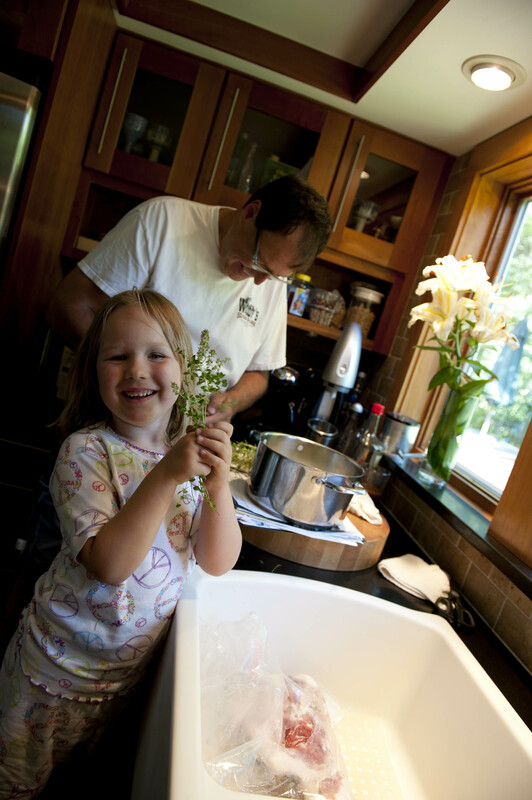 Getting the curing ingredients together: picking thyme leaves. Finding room in my spare fridge to cure the meat was easy…everything fit snugly in a Ziploc bag. But once it was time to dry the jowls (all 24 of them since I bought 6 pounds,) I had to rig up a special hanging system that used bungy cords, vinyl cable ties, and beer cans…don’t ask. But it worked! And three weeks later, I was frying up my guanciale in a sautee pan and adding it to vegetables, potatoes, and pizza. I even gave guanciale gifts to my foodie friends. And before long, it was time to make more. Since that first curing effort, some things had changed. My source for heritage pork, Caw Caw Creek, now carried pork jowls, too. And I was able to buy a couple of 3-pound jowls at a time. They were big, thick, and what I originally envisioned when I dreamed of the jowl of a pig that weighed 300 pounds or more. I cut the two big jowls into 1/2–pound, 3-inch thick slabs, and cured them using the same recipe. A big, beautiful jowl in its native habitat. All was fine until one time, I went away on vacation, and a hurricane hit our neighborhood, knocking the power out. Fortunately, my good neighbors came to my rescue and started up my generator, plugged in the fridge, and saved the guanciale! I was back in business. 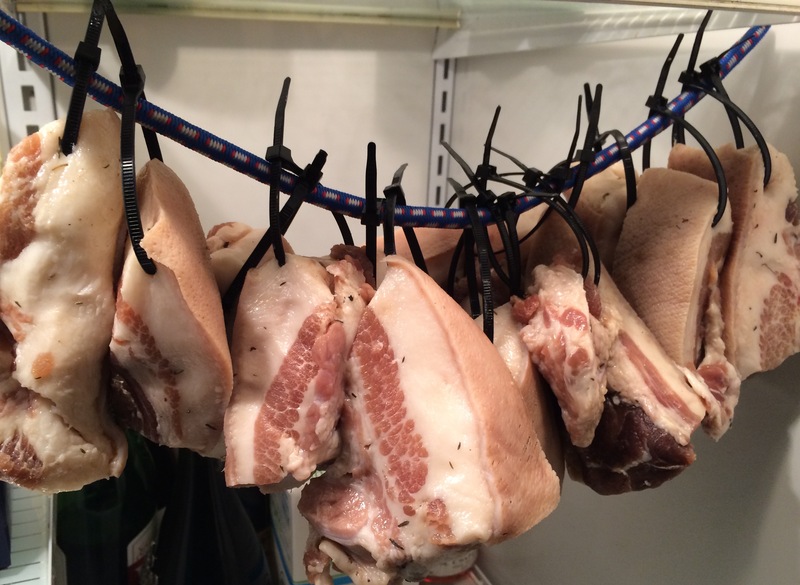 Curing and hanging completed (I now used a far more sophisticated system of stereo wire instead of bungy cords and beer cans, as seen in the photo,) I’ve been sharing the goodness of this incredible and little-known pork product with anyone who would listen—and taste. A year ago, I had never heard of guanciale. Now, I can’t imagine not having a slab at the ready in my fridge. I use it just about anywhere I would use bacon, short of a BLT. And by the way…I’ve yet to make the spaghetti carbonara recipe!